I am so happy to have my string quilt finished! to my daughter, as she "fell in love" with it at first sight! If I highlight this block, it's because I remember that when I started to select my fabrics for this project, I hesitated and almost decided to put this yellow one away... thanks God I did'nt, it appears to be THE ONE! It seems to bring sun to my quilt. It's beautiful! Are there good places to get fabrics like this in Greece? (I live in Poland--quilting fabric is "slightly" scarce here (understatement). Thanks Becky! 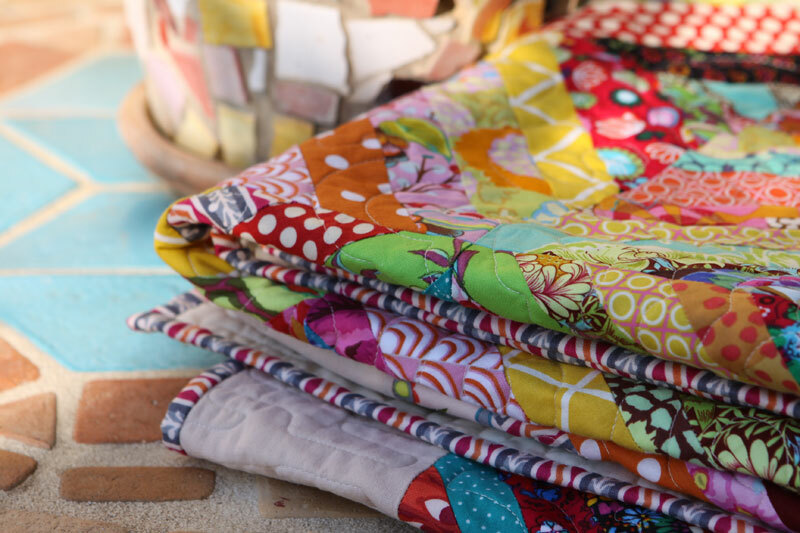 There are few shops here where you can find quilting fabrics but with very poor choice. Mainly I order them from USA. Absolutely beautiful! Your daughter is a lucky woman! Beautiful string quilt! Thay are so much fun to make. STUNNING!!! 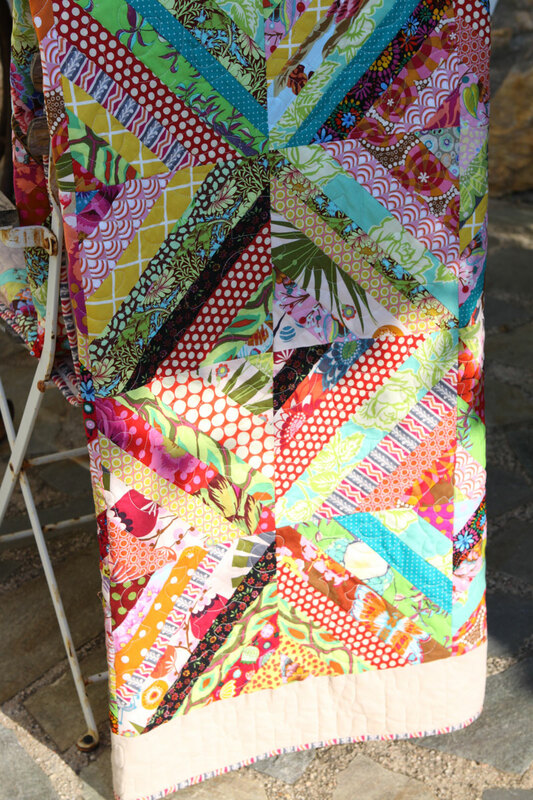 Absolutely LOVE the fabrics in this quilt!! I would be OVER THE MOON if I were your daughter!!! Beautiful! You have inspired me to make a string quil! Marvellous !! 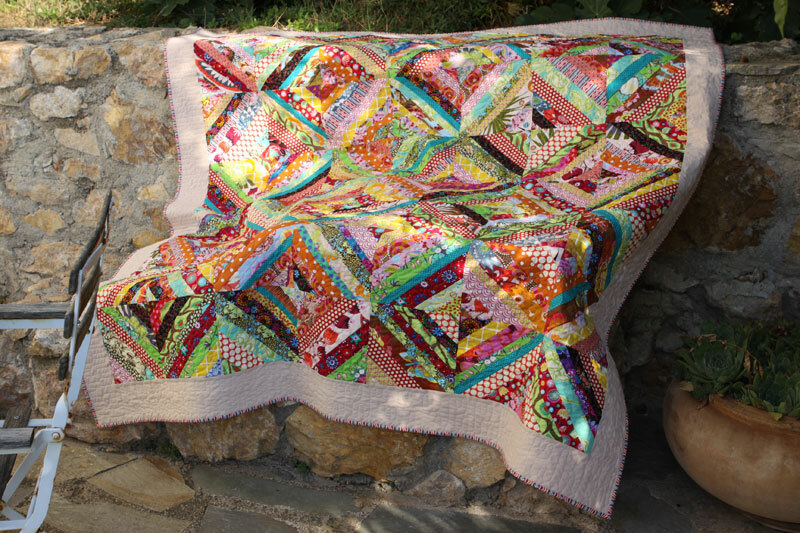 This colorful quilt is a really " plaisir des yeux "...Lucky Manon !! Marvellous !! 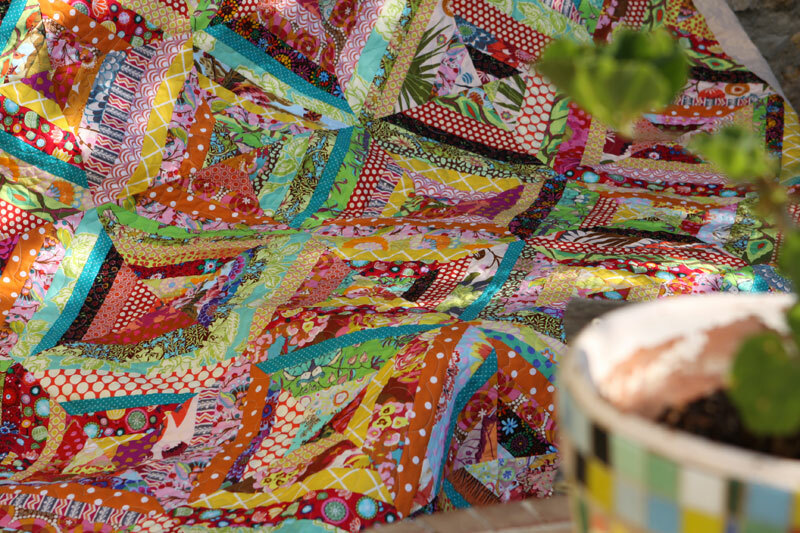 This colourful quilt is a really.." plaisir des yeux "..Lucky Manon ! This is such a terrific quilt Christine! It's no wonder that your daughter fell in love with it at first sight! Beautiful fabric combinations and i love how the plain border makes it all Pop! Congrats on a beautiful finish. It is so sunny and bright, I'm sure it will cheer up your daughter everyday. So cheery! I love making strong quilts. Yours is a sunny happy one. Lucky daughter! Such a pretty happy quilt, a great finish. wow! what a quilt! and your pictures are great, the light reminds me of late summer time evenings in Greece. It has been great to see your string quilt project step by step. Thanks a lot for sharing and congratulations! It is a beautiful finish, and so crisp and sharp! I would always keep in the yellow myself!!! I really love the quilt! Absolutely beautiful!! So glad you left the yellow in. Your daughter will be so blessed to receive this quilt! I just love it! It's so fresh and pretty and summery and sunny - like a garden full of beautiful flowers! This is lovely. Thanks so much for sharing it with us. I recently sent a string quilt off to be quilted, but mine is no where near as elaborate or fancy as yours. I hope your daughter gets lots of joy out of this quilt. Wow this came together beautifully. It has a very cozy feeling to it. I see why your daughter fell in love at first sight! Oh my this quilt is just gorgeous. Love it. String quilts are so much fun. It's been a long time since I've made one. I have giving a spiderweb a try on my to do list. What a beauty, Christine! You chose just the right mix of prints! Such a fun, fresh quilt. No wonder your daughter fell in love. I really like the colourful stripey binding against the plain border. Really ties everything together perfectly! It's no surprise that she fell in love with this quilt, it is so beautiful. I could look at the pictures all day! I agree....an awesome finish! You've inspired me to make a strippy quilt soon!! I'm so glad you shared this as one of your favorites!! I'll be sure to let you know when I start mine! it's so exciting!! I can't imagine receiving this! That binding is spectacular. Formidable! I haven't seen you around my blog lately Christine... miss you LeeAnna at not afraid of color! String quilts are my favorite, and yours is just lovely. Very happy quilt. I haven't done a string quilt yet - but it's on my list. The colors in this quilt just sing! Your quilt is gorgeous! I love all the happy bright colors. Your daughter is one lucky girl. This is beautiful! I love the quilting in the border. Christine I love string quilts and yours is beautiful! 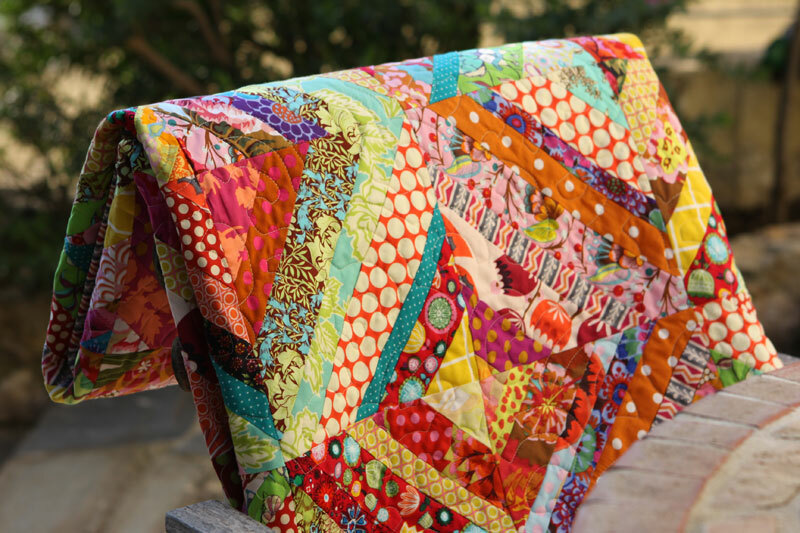 Charming quilt, Christine -- love how cheerful it looks! A wonderful string quilt! I hope you are also a contributor on the "String Thing Along", if it hasn't already, this one will wow the group. Thanks for sharing it at Val's! I love string quilts! 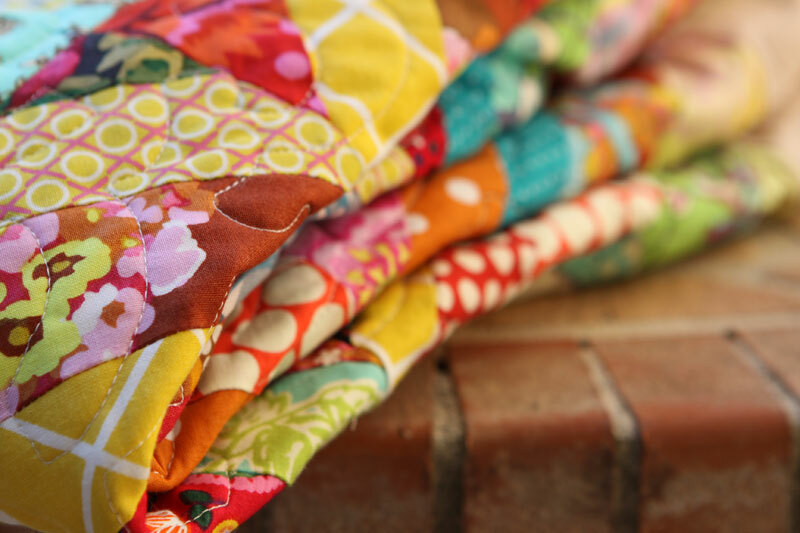 Your quilt is bright and cheery! What a beautiful string quilt Christine, I can see why your daughter loves it! Thanks for sharing! Gorgeous! I can see why your daughter fell in love with it. You get a fabulous and colorful quilt.Sure your daughter will be delighted!! 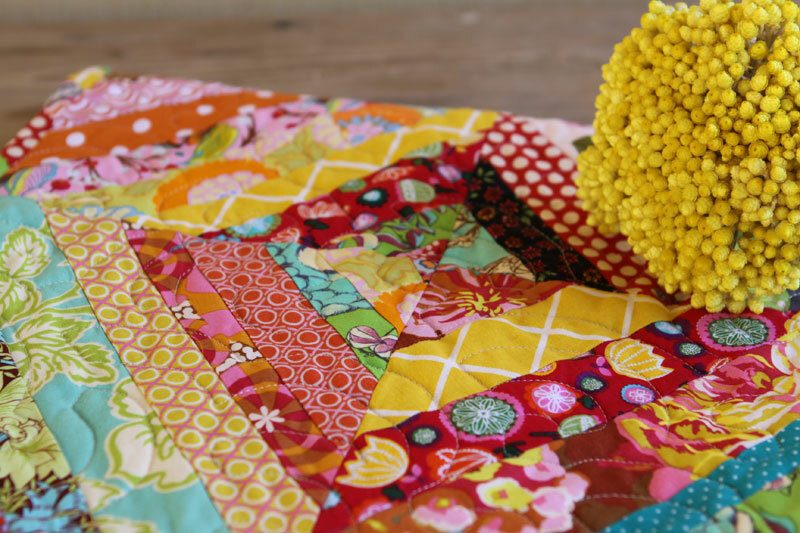 Such a lovely quilt, and yes, the yellow is perfect! Your daughter will be so pleased. In my part of the world it has been dark and foggy, so a sunny Sunday would be a real treat. Awesome! I love string quilts. Gorgeous! 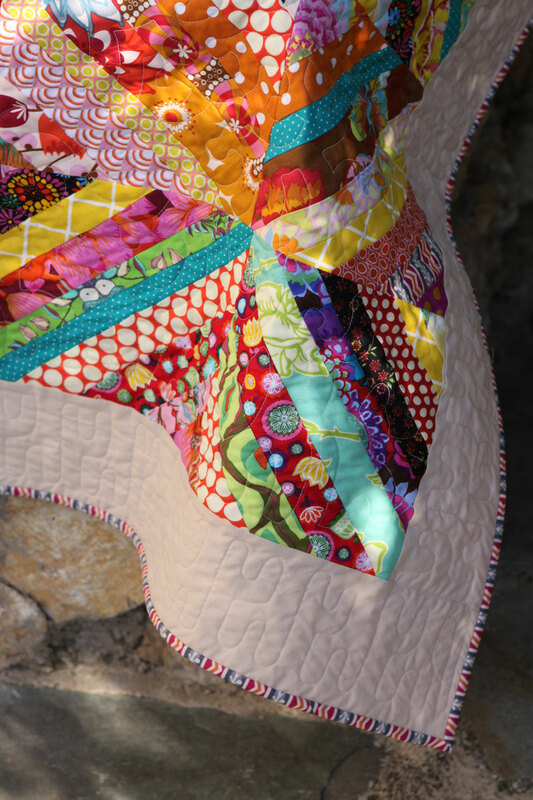 I think string quilts are should be called jewel quilts. String is hairy and dull and has nothing in common with such a lovely thing! I love string quilts and yours is so pretty. I have made one and want to make another! The saturated colors take me to a sunny place. Beautiful. So beautiful colours. I'm in love! This is just gorgeous! I just love your fabric picks. My bright strings are building up, and I'm excited for the day when I start one. I could only hope it turns out as pretty as yours. what a great finish! It is absolutely beautiful! This is beautiful. I absolutely love string quilts, and have been thinking that it is time to start another! Love this quilt. I am making my first one now, the colors are wonderful.